I am going to post every Web 2.0 achievement by my colleagues. 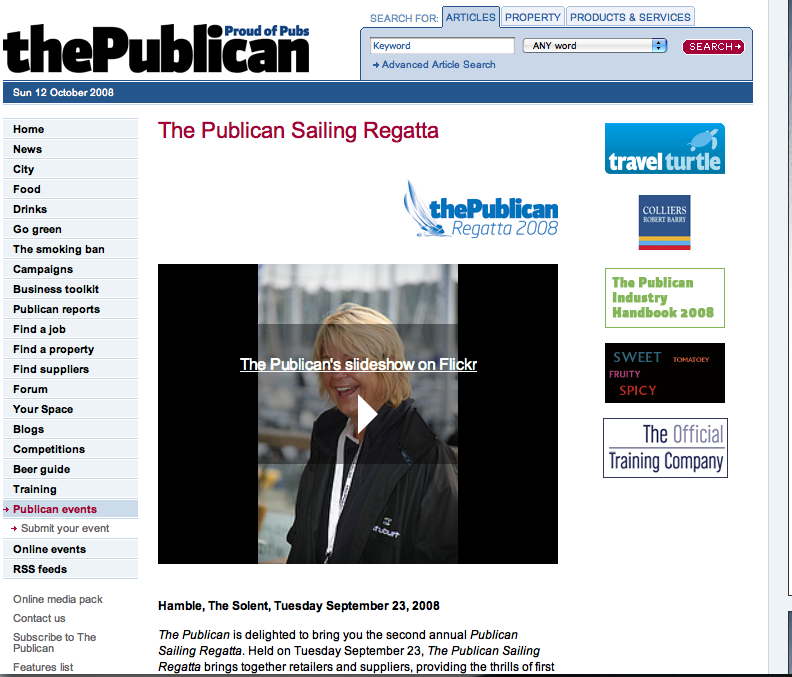 First off comes The Publican, our magazine for the licensed trade, with a slide show of the recent Publican Sailing Regatta. Web editor Roland Ellison set up a Flickr account, loaded up the photos of the recent event and then set it on Flickr’s great “slide show” functionality. The embed code, easily retrievable, was then placed within what would normally be the space for an MPU, therefore using DoubleClick to overcome any problems with the platform. Next week, The Publican hosts the Magners’ Pub Comedy Awards. Roland is encouraging the editorial team to take lots of photos and send them directly to The Publican’s Flickr account. What fun! This entry was posted in New Media, UBM and tagged Flickr, Roland Ellison, The Publican, Web 2.0, Web 2.0 achievements. Bookmark the permalink.